England's Georgia Hall shot a 3-under-par 69 Saturday to move a shot off the lead at LPGA Q-School's second stage event at Plantation Golf & Country Club in Venice, Florida. 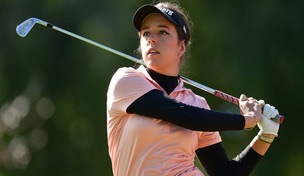 Hall, an emerging Ladies European Tour stand-out, has had scores of 71, 68 and 69 FOR eight-under-par 208, and is one stroke behind the leader, Hungary's Csicsi Rozsa (72), who moved to 9 under overall with scores of 67, 68 and 72 for 207. Ireland's Leona Maguire, the world No. 1 female amateur and Duke University's two-time Annika Award winner as collegiate women's golf's best player, posted a 70 to move into a tie for fourth, two shots off the lead. Aberdonian Gemma Dryburgh's prospects look good after improving rounds of 74, 72 and 70 for 216 and a T25 position going into the final round. However, Scotland's four other representatives did not have good day -- Vikki Laing is T105 after rounds of 74, 71 and 79 for 224. Kylie Henry (76-74-77) and Carly Booth (75-75-77) are T128 on 227 and Michele Thomson is T134 on 228 after rounds of 74, 78 and 76 for 228. There is no cut but only the lowest 80 72-hole totals and ties from the starting field of 192 players, four of whom have since pulled out, will advance to the final stage of Q-School in December.